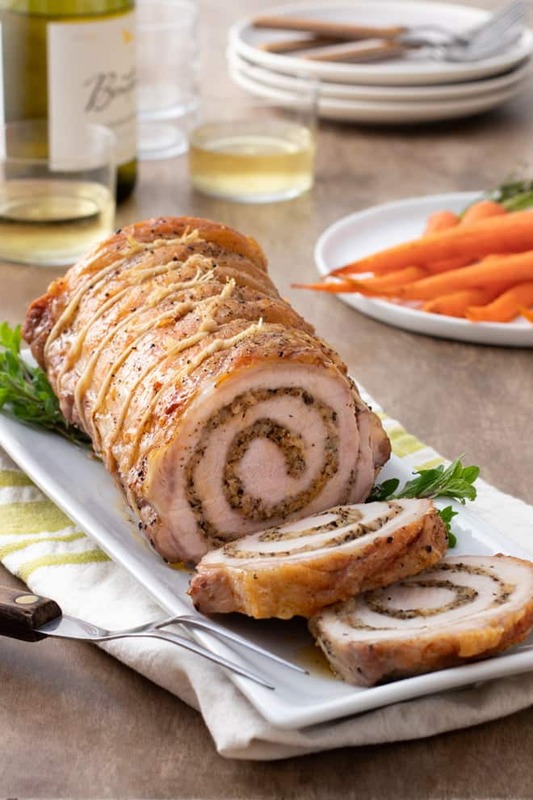 Stuffing a pork loin not only adds flavor—it significantly ups the WOW factor! 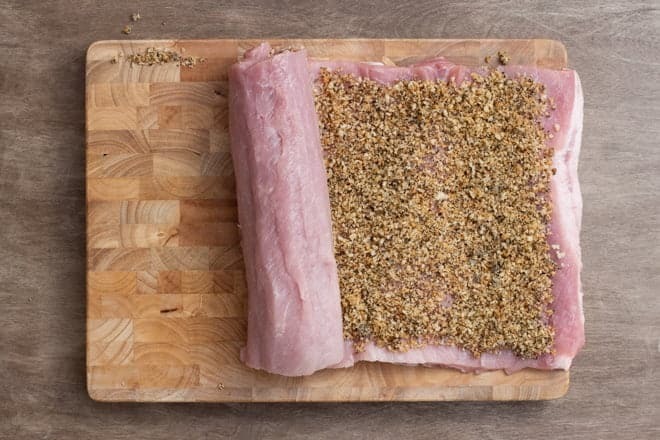 There are a few different ways you can stuff a pork loin. The simplest way is to cut the cylinder of meat lengthwise so it opens up like a book, add the stuffing, and close it up again. Sometimes this is called butterflying and it makes for slices of meat that look like this. Another way to do it is to make a hole down the middle of the loin, creating a sort of tube and filling the tube with stuffing. It makes for slices that have a donut-shaped piece of meat with the stuffing in the center, like this. 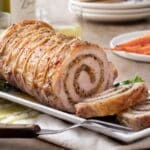 My favorite, though, is a spiral-cut—because its slices are the most impressive, beautiful spirals of meat and filling. Confusingly, this is also sometimes called butterflying, even though it’s completely different than the first option. It’s also sometimes called a roll cut because the final roast looks like a jelly roll. Either way, it’s not that hard to do and even if you don’t do it perfectly, once the meat is rolled back up, cooked, and sliced, most of the “mistakes” will magically disappear! Start with the loin on a large cutting board. 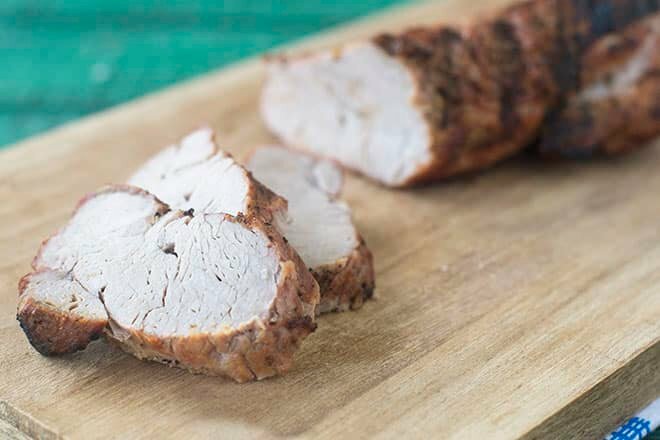 (Don’t know the difference between a pork loin and a pork tenderloin? 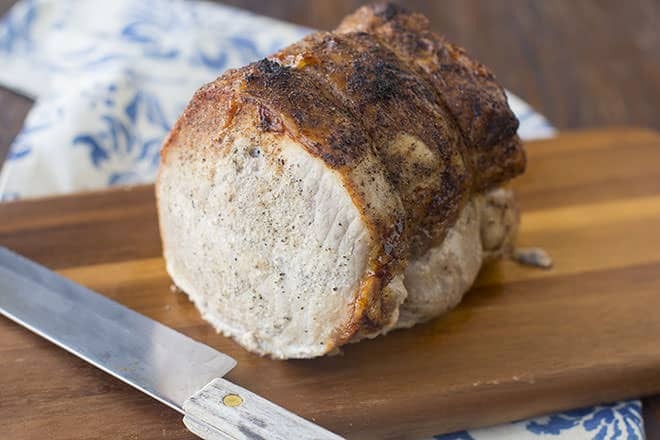 Jump over to this post here [link to Rosemary Garlic Pork Roast post].) Put the meat perpendicular to you and make a cut along one side of the cylinder about 1/2-inch from the edge, stopping short of the cutting board by about 1/2 inch. 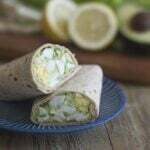 You’ll end up with a 1/2-inch flap of meat, running the length of the cylinder, on the same side as your cutting hand (your right if you’re right-handed). Change your knife so it’s parallel to the cutting board. Starting where the flap meets the cylinder, cut into the meat (away from the flap), keeping your knife 1/2 inch above the cutting board. 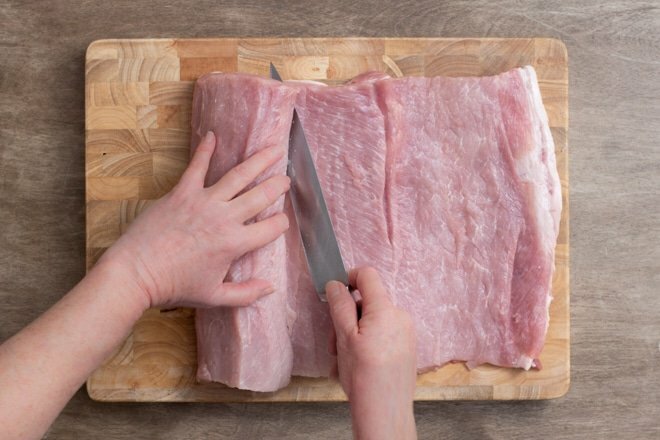 Continue this cut, pulling the meat away from the knife with your other hand, like you’re unrolling a carpet. Eventually, you’ll have one large rectangle of meat that’s about 1/2-inch thick. Ta-da! If there are places that the meat feels too thick, make a shallow slit in those spots and press the meat open (you can see where I made a slit like this towards the right in the photo above). If the surface of the meat looks a little ragged or there are holes, don’t worry too much. Most of those imperfections will be unnoticeable once the roast reaches the dinner table. Add your stuffing to the top of this rectangle, using my recipe below or your own. About a 1/4-inch thickness is ideal. Starting at what was the inside of the meat, reroll it into a cylinder, then tie it with kitchen twine. And like I said, once your spiral cut roast gets to the table, the slices not only look impressive, but they’re tasty, too. 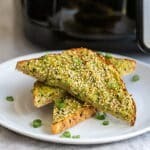 Because the stuffing adds flavor to the roast through and through! Meanwhile, place the pork on a cutting board, fat side down. 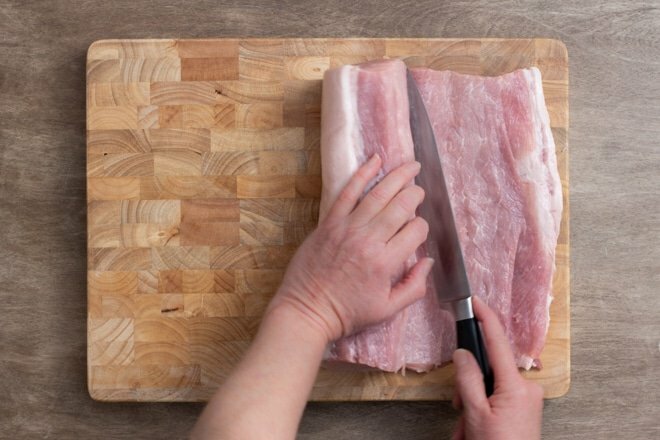 With a sharp boning or carving knife, cut down along one long side of the loin, about 1/2 inch from the edge, stopping 1/2 inch from the cutting board. 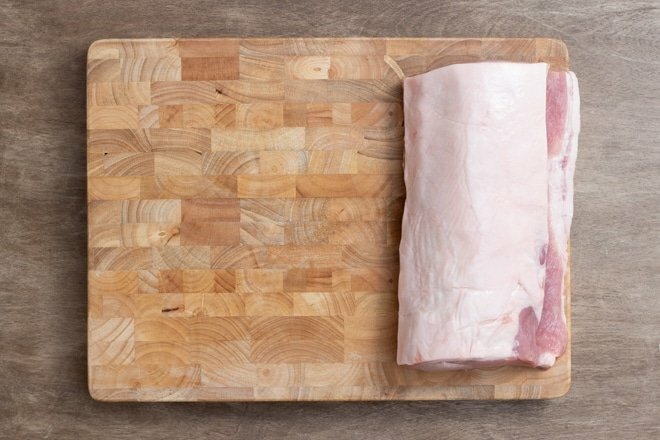 Turn the knife parallel to the cutting board and cut inward 1/2 inch above the cutting board, unrolling the roast like a carpet. Continue until the loin is one long flat piece, about 1/2 inch thick. Mix together the panko, cheese, butter, herbs, 1 teaspoon salt, and 1 teaspoon pepper. Spread the mixture all over the pork. Beginning at the end that was the interior, roll the roast up and tie with kitchen twine every 1 1/2 to 2 inches. 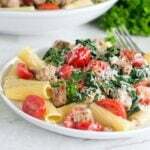 Sprinkle with the remaining 1/2 teaspoon salt and 1/2 teaspoon pepper. Put the pork on a rack in a roasting pan fat side up. If you don’t have a rack use about 5 stalks of celery arranged in the pan. Roast until the internal temperature is 145-160°F, 20 to 25 minutes per pound. 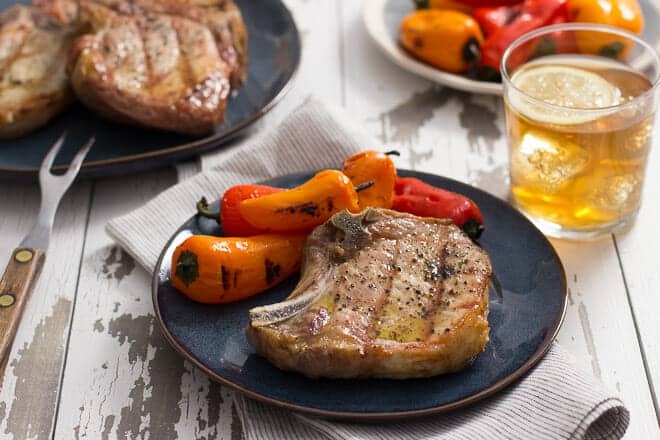 145°F is considered safe for pork according to the USDA. It will be moist and slightly pink in the center. If you prefer your pork fully white and well done, then go with the 160°F temperature. Cover the roasting pan with foil and let rest for 30 minutes. Meanwhile, increase the oven to 475°F. Roast uncovered for another 10 minutes, until the meat is nicely browned. 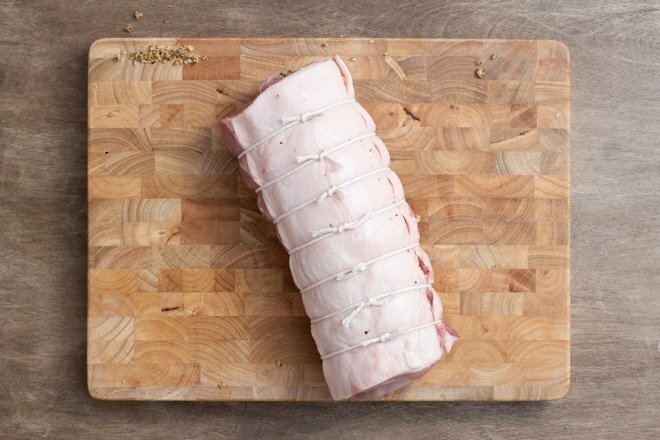 Remove the twine, slice the roast, and serve immediately. 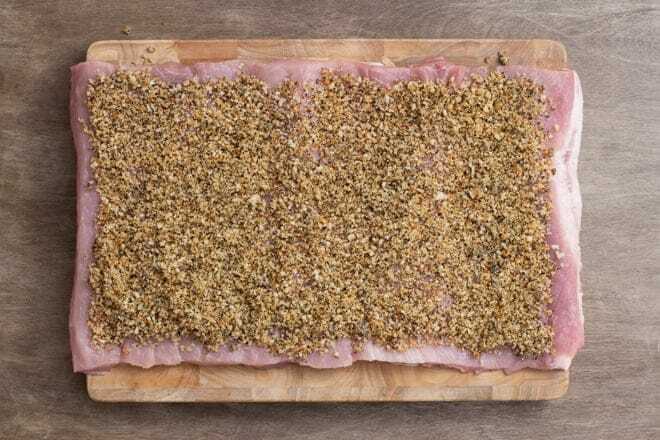 Note: For even more flavorful meat, brine the pork before you roast it. But if you do, cut the salt in this recipe to a little more than 1/2 teaspoon. 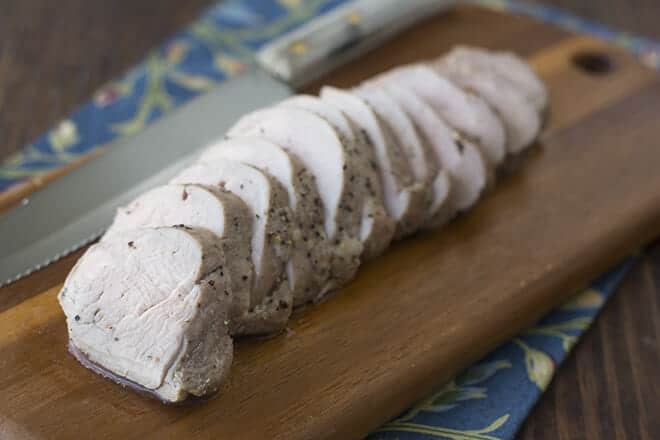 See this post for how to brine and why it makes such a difference.